Items on display in the 1865 European style palace. Upper passageway at Hill Palace Museum, Thripunithura. The floor appears to be stone tiles. Carved wooden columns and glass windows line the gallery that extends around the upper storey. I see it as a much-modernized, distant echo of the wooden galleries that surround the traditional palaces, such as Krishnapuram Palace. This is an oil-burning metal lamp that I saw in a display case. 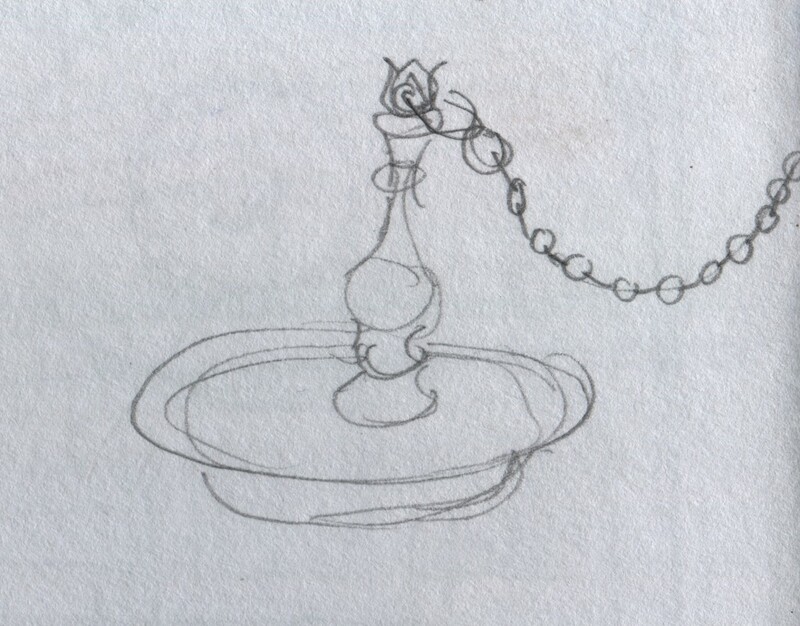 The open pan at the lamp’s base contains the oil, and people rest wicks on the pan’s brim, and light the wicks. The brim can support one or many wicks, depending on the need for light. 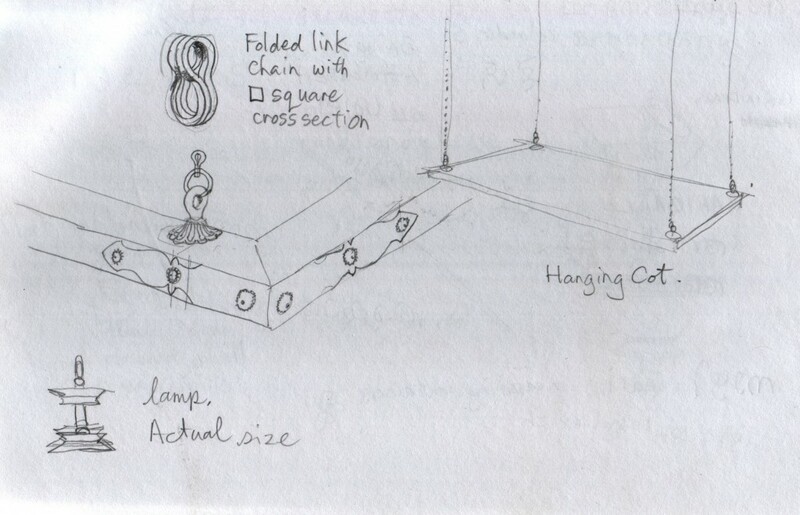 A chain is one several methods of supporting a lamp. 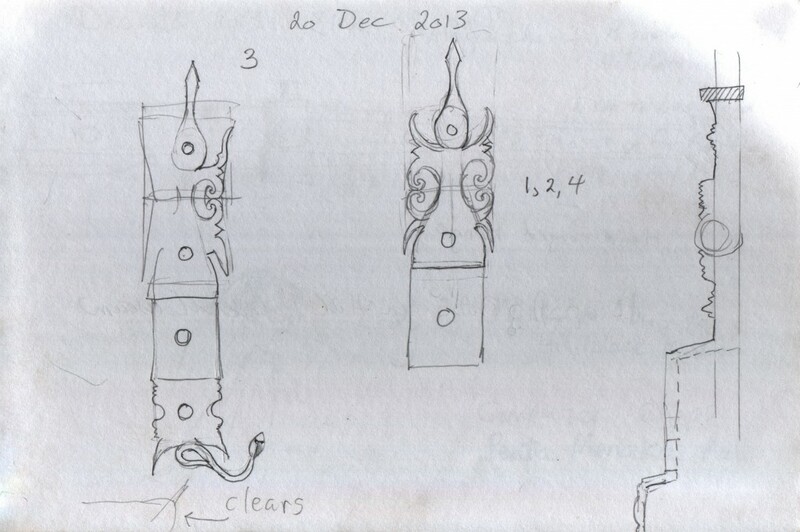 Other lamps stand atop built-in pedestals or are mounted on the wall. 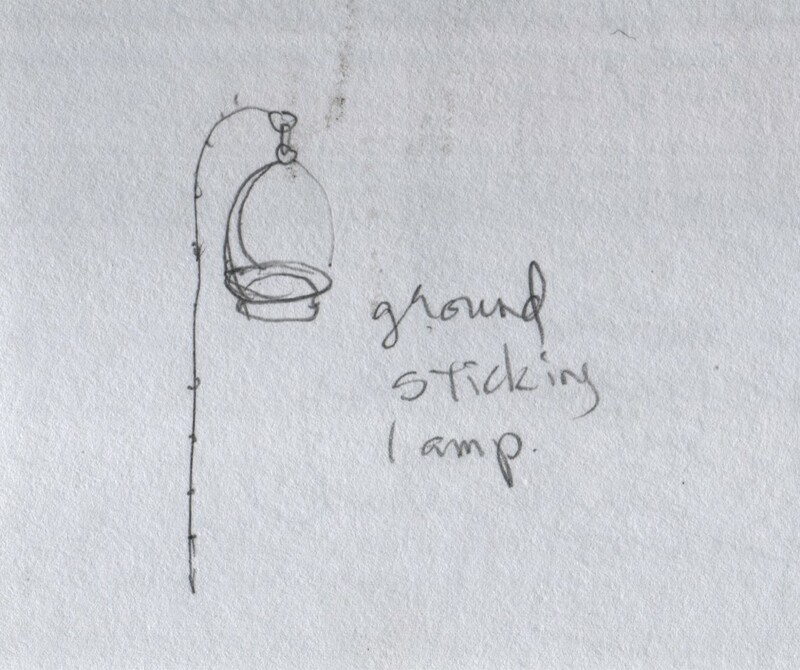 A hanging lamp is called തൂക്കു വിളക്ക് (thookku vilakku). 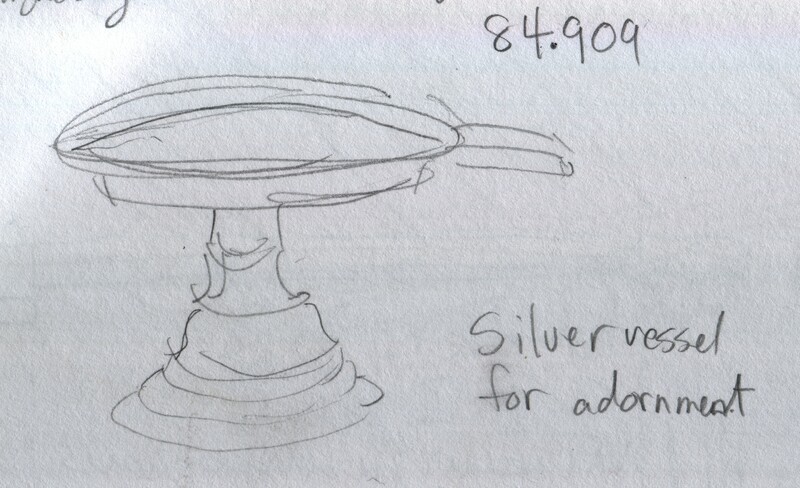 “Silver vessel for adornment”. 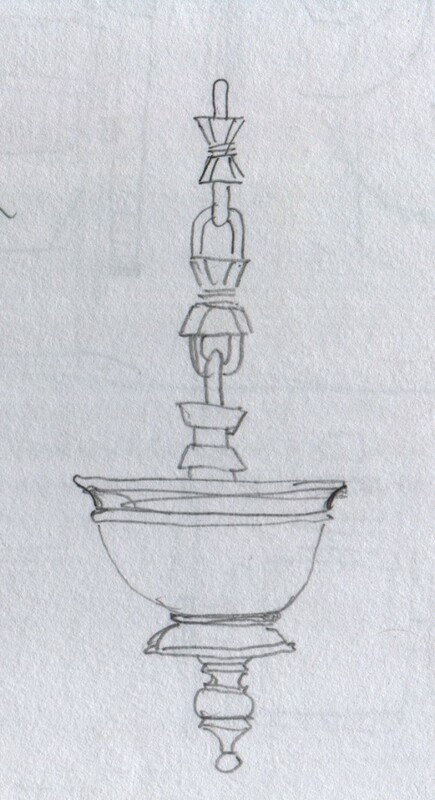 The shallow basin on a pedestal has a spout on one side. I did not find out what is its function. This brass lamp hangs from a staff that one can stick into the ground. Hill Palace Museum, Thripunithura. This is the capital of the Chera carved wooden column that stands in Hill Palace Museum, Thripunithura. Another visitor told me that this style was from neighbouring Tamil Nadu, not originating in Kerala. 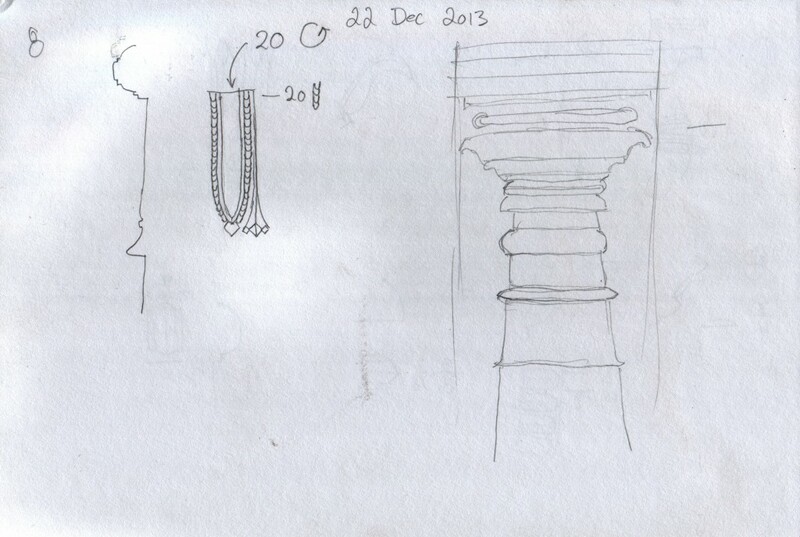 The Chera column tapers markedly. The base has intricately hollow, undercut, turned designs. 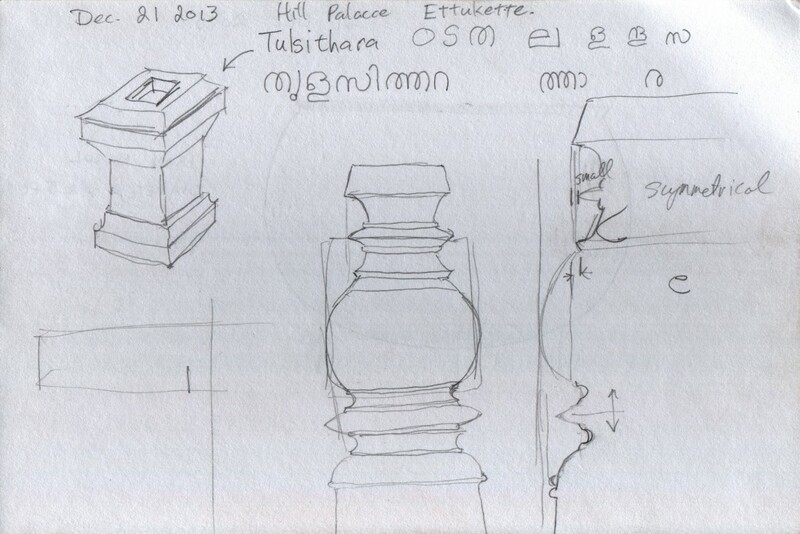 This collage is three studies of a Chera column at the Hill Palace Museum in Thripunithura. 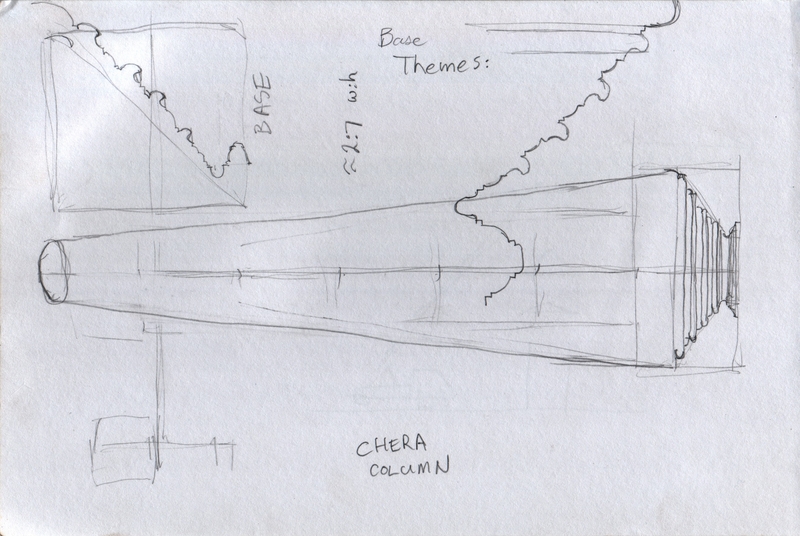 The zig-zag curved lines are my attempt to draw the base profile. 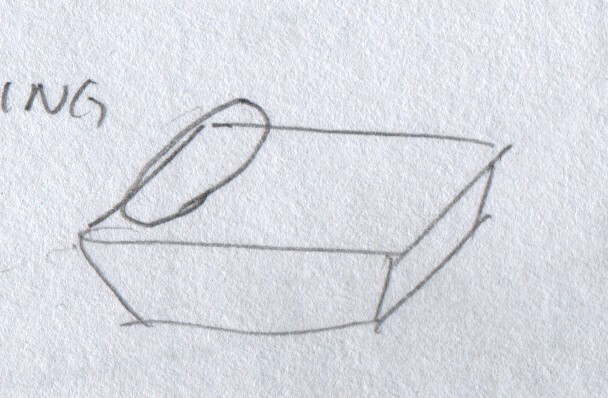 One profile drawing, “BASE”, is rotated 90°. The Chera wooden column has an intricately carved capital. These are some of the elements that make up the capital’s ornamentation. The capital of the Chera wooden column in Hill Palace Museum, Thripunithura. 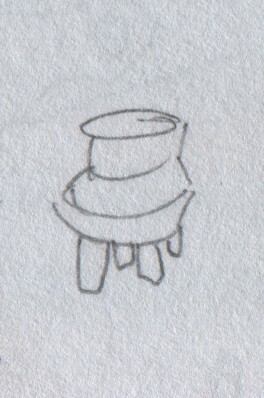 One of the elements that makes up the fringed skirt of the capital is at left. Royal carriage. 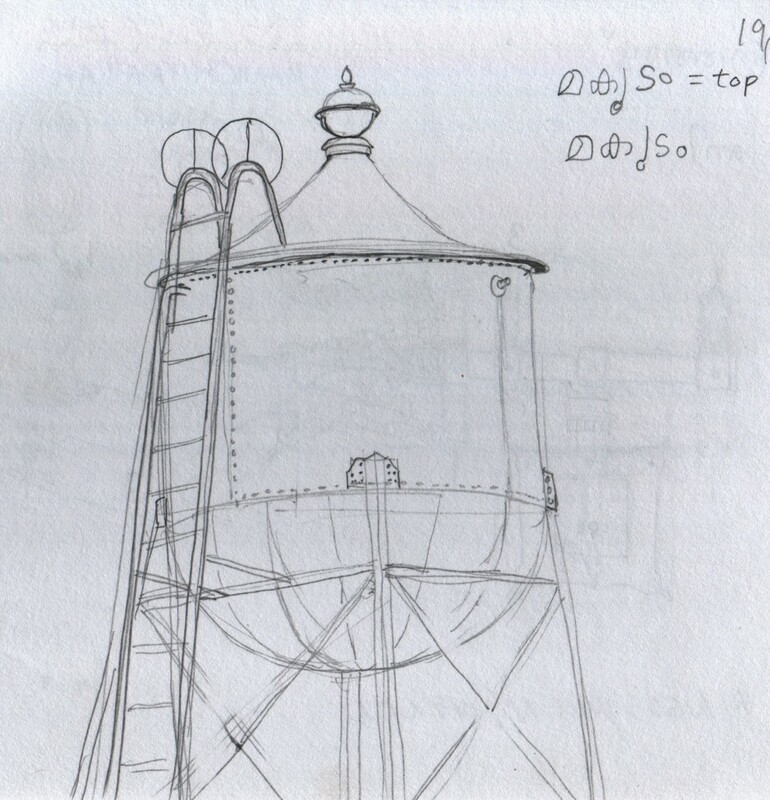 Some parts had stampings that indicate that they were built in Madras, now Chennai. 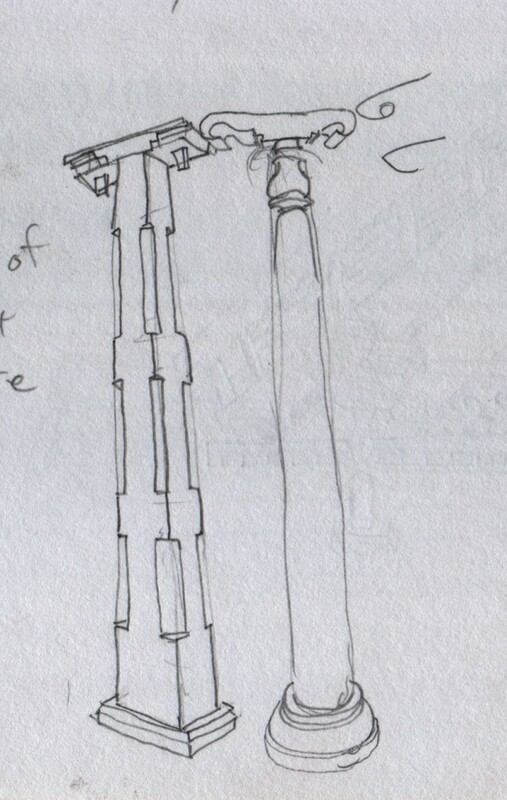 The suspension is complex, and the forgings elaborate. At right is part of the steering axle. Exploded sketch of the royal carriage suspension. 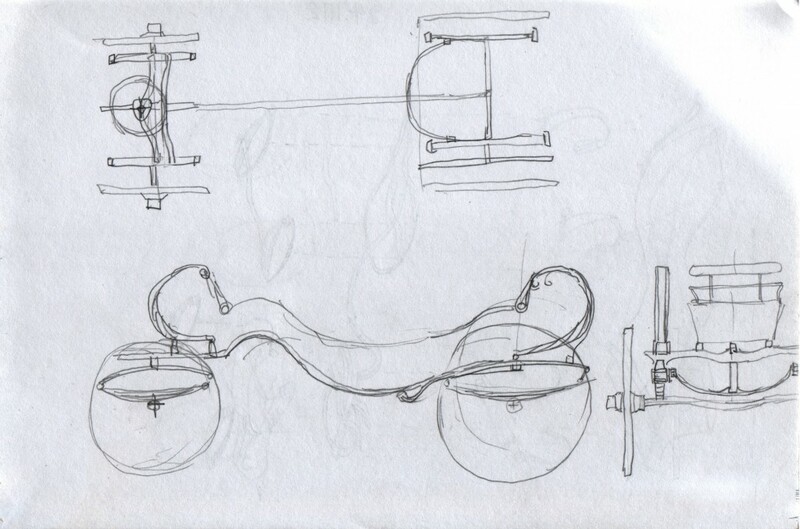 Semi-elliptic springs suspend the chassis on solid axles front and rear. 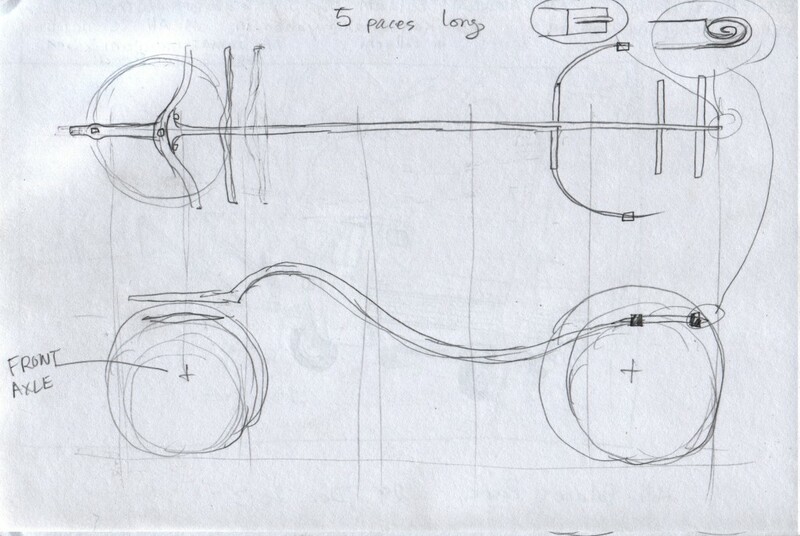 Four more quarter elliptic springs suspend the cabin on leather straps. Royal chariot, or carriage, at Hill Palace Museum. 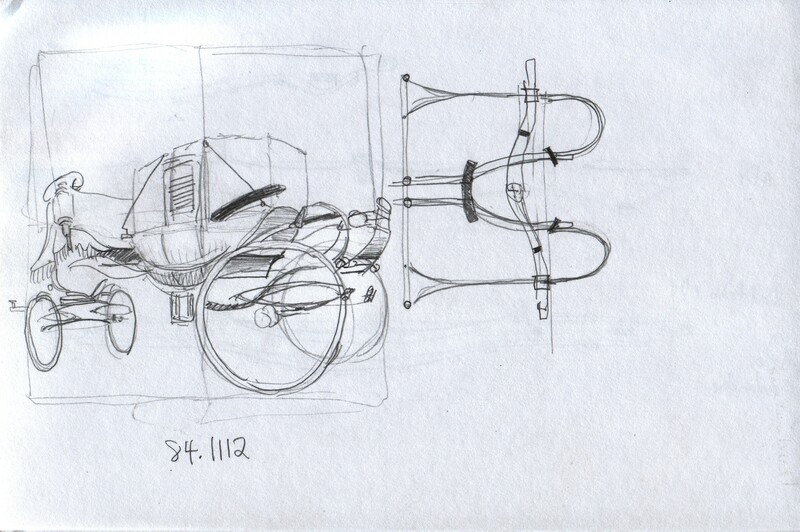 I took it upon myself to understand this sophisticated vehicle, with its forged steel backbone and complicated suspension. The steel backbone is one of the most beautifully forged pieces of steel that I have ever seen. 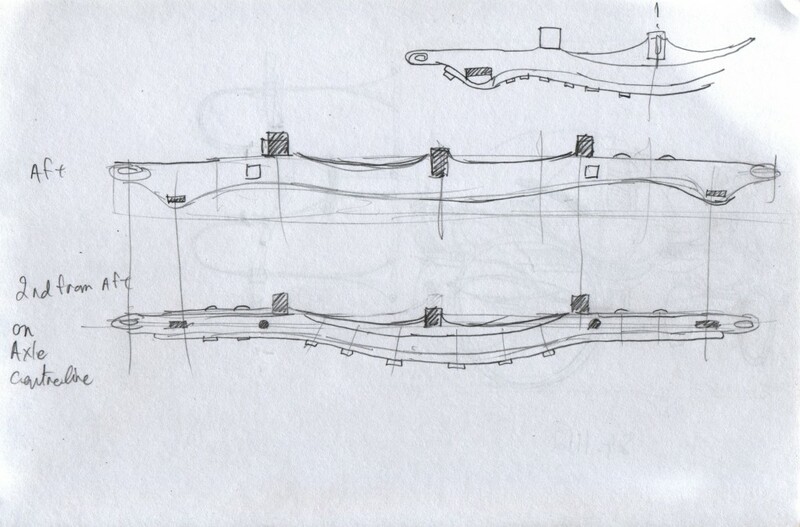 It is perhaps twelve or fifteen feet long. It is curved, and it has forged into it several junctions where other chassis parts attach. The transitions to the joints are elegant and curved. The backbone appears to have been carefully thought out to be light, strong and flexible. 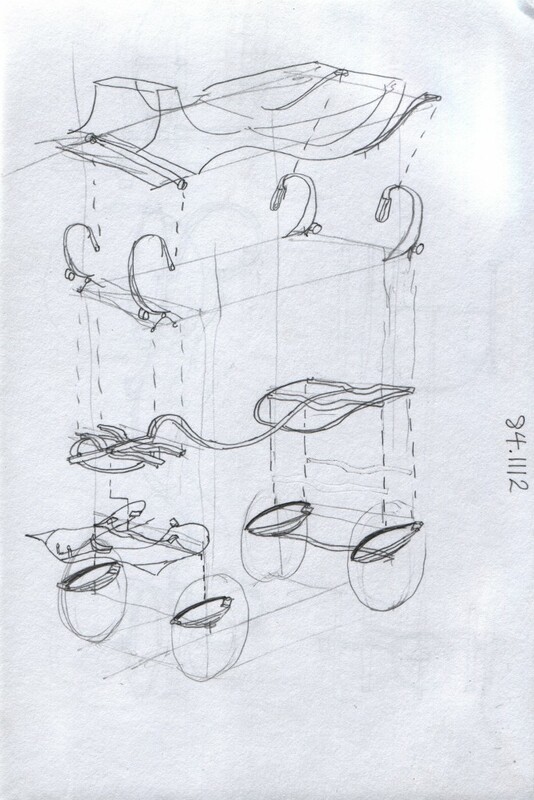 The carriage has a long, curved steel backbone. The builders smoothed with long, graceful curves the crossmember attachment points. These curves, in addition to adding to the chassis’s beauty, make the connections stronger and more durable. 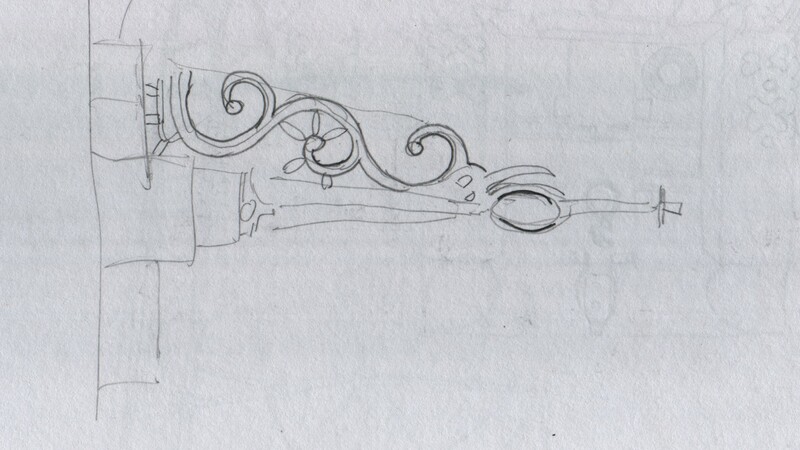 The two aft-most cross bars on the carriage’s chassis. Curved steel forgings mate smoothly with carved wooden cross bars. This figure of Thara, താര, had a beatific smile. 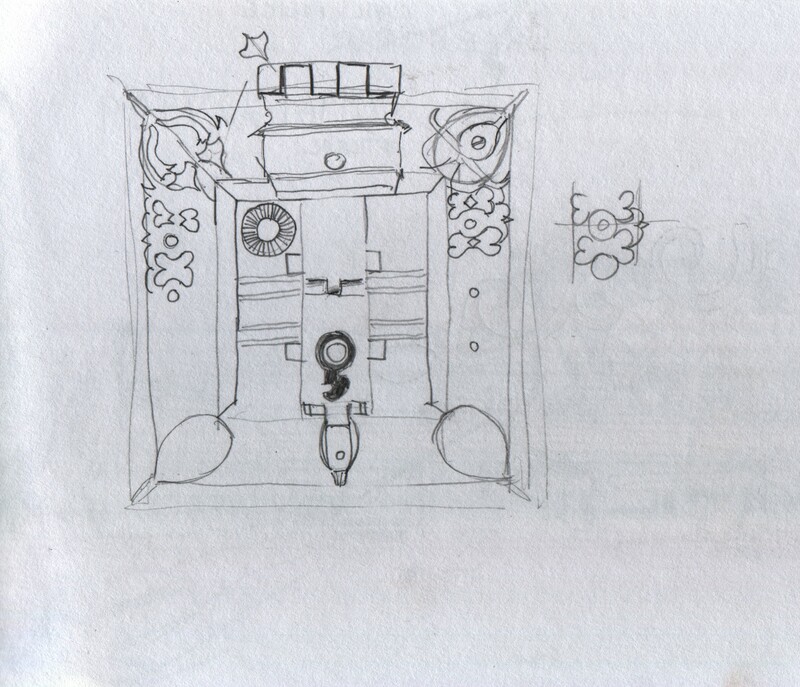 No, my sketch does not do it justice. The Ettukettu, or two-courtyard traditional palace from 1850. One of the paths leading to the old palace, or “ettukettu”, at the Hill Palace Museum complex in Thripunithura. “Ettukettu” means “eight halls”. An ettukettu has two courtyards, each with four adjoining rooms. The old palace is nestled into the hillside, veiled by trees. Paths meander through the large estate, much of it landscaped garden. One perceives that one crosses a gulf of distance and time when walking from the bright, busy new palace to the peaceful, shaded ettukettu. The Cochin royal family lived in the old palace until they built the newer palace elsewhere on the vast palace grounds in the 1800s. Roof detail of Ettukettu, or “eight-halled” palace with two courtyards. 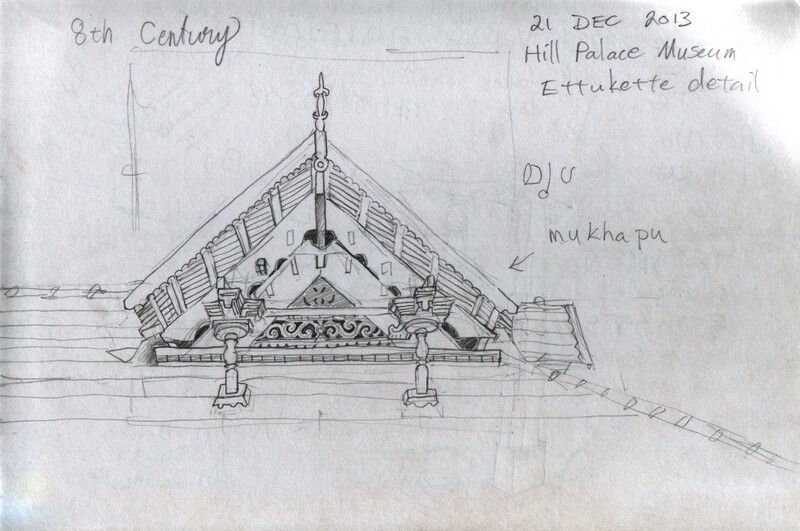 The dormer depicted here is known in Malayalam as “mukhappu”, related to the word മുഖം (mukham) or “face”. The roof’s structure, including the dormer’s, is made of fretsawn and carved wood. 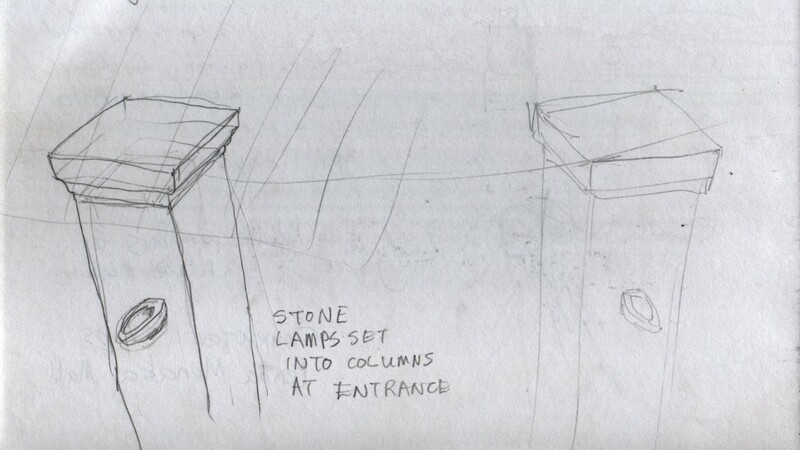 Two masonry columns: each has an oil-burning stone lamp let into the surface. A visitor would see the lamps when approaching the old palace’s entrance. 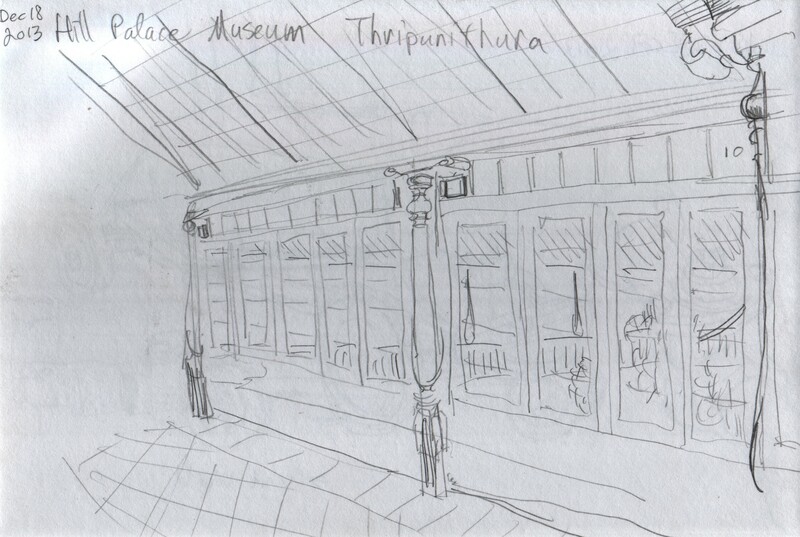 Ettukettu, Hill Palace Museum, Thripunithura. 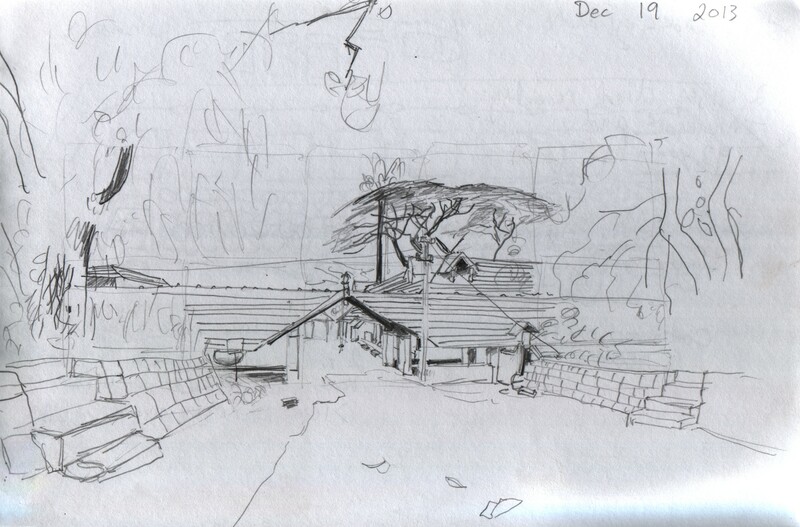 A roofed-over area adjoins the ettukettu at Hill Palace Museum. Two types of columns hold up the roofs: rectilinear columns and round columns. The palace proper has the round columns supporting its overhanging roof, and the free-standing roofed-over area has the rectilinear columns. The tulasittara, തുളസിത്തറ, is a stonework planter in which Hindu householders keep the tulasi, തുളസി, plant. I saw this one near the traditional palace at Hill Palace Museum. The tulasi plant is sacred for Hindus. Traditional Hindu houses will have a tulasittara on the property in front of the house. Another name for the plant is holy basil. 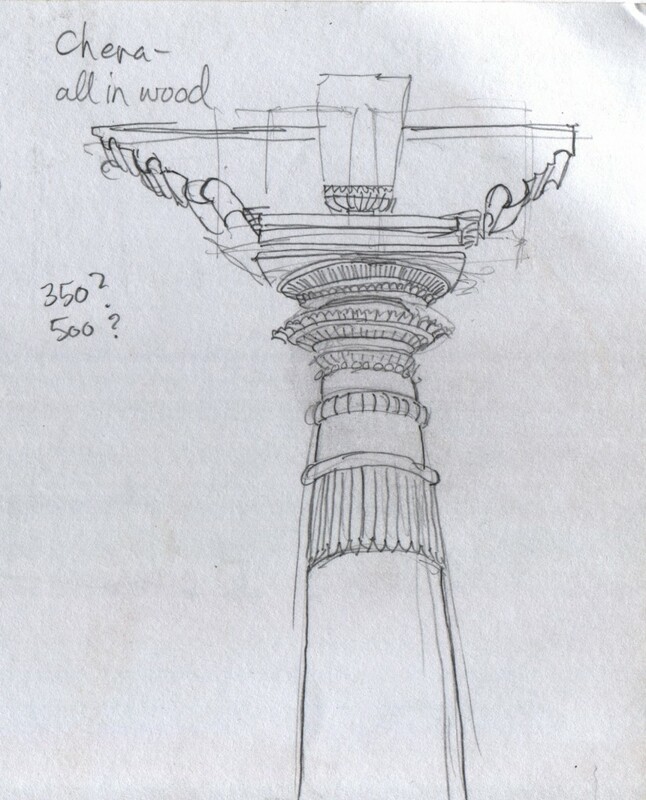 The sketch on the right is a study of the top of one of the round columns supporting the palace’s roof. A vast iron cauldron stands before the traditional palace at Hill Palace Museum. 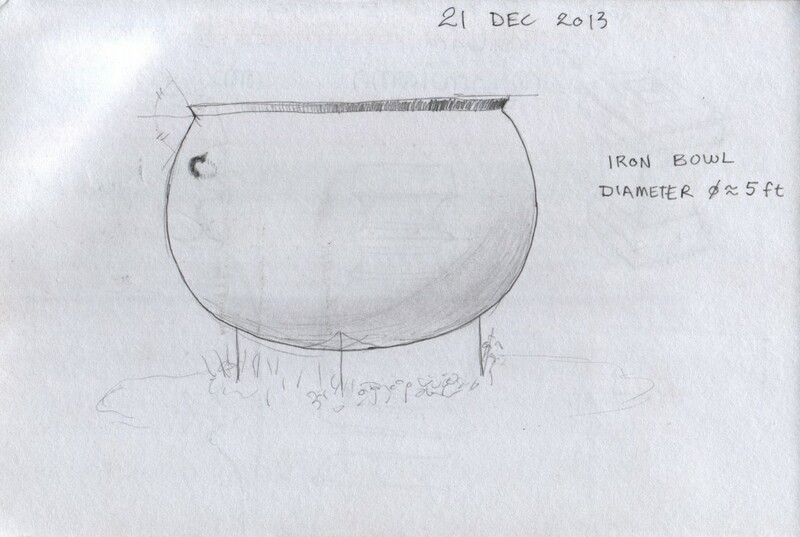 I estimate that the bowl at its brim is around five feet, or 1.5 metres, in diameter. The cauldron’s bowl is nearly spherical. A museum guide explained that the royal family historically filled the cauldron with food for the public as a service to the poor. 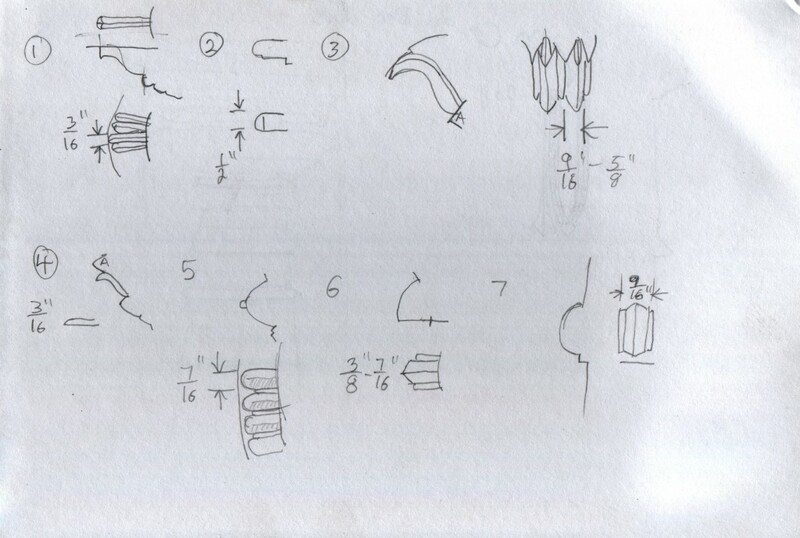 Bhasmathattu. This is a wooden vessel hanging from a carved wooden chain. This vessel contains holy ash that priests prepare at a temple. Devotees apply this ash to their forehead after performing morning prayer, or pooja. I think that the Malayalam word for this ash vessel is ഭസ്മത്തട്ട് (bhasmathattu). I think that the word for the Ettukettu palace is എട്ട്കെട്ട് (ettukettu). Nine cooking stations in the palace kitchen. Eight stone blocks encompassed by a stone wall make up the stove. The cooks burned firewood in the gaps between the stone blocks, and the pots with the food sat on top of the gaps. Curved cutouts in the back wall cradled the pots, and the corners of the blocks supported the fronts of the pots. This traditional food grinder consists of a stone roller on a stone slab. I saw similar grinders in the kitchens in those homes that I visited. Hardware stores sell brand new ones, also of stone. The Malayalam name for this grind stone is അരകല്ല് (arakallu). I have also seen its name spelled “ammikallu“. Hill Palace Museum in Thripunithura. This marakaal, grain vessel, has four legs. Hanging cot in the Ettukettu, or traditional palace. The chain links have an interesting form, each link forged of one continuous piece of square stock. The cot itself is a panel made of wood, with ornamental sheet metal trim on the corners. The small oil lamp in the picture is about an inch high, and was exhibited in a display case. It was the smallest that I saw. Most such oil lamps are at least six inches high and may commonly be four feet tall. The Malayalam name for this type of lamp is നിലവിളക്ക് (nilavilakku). 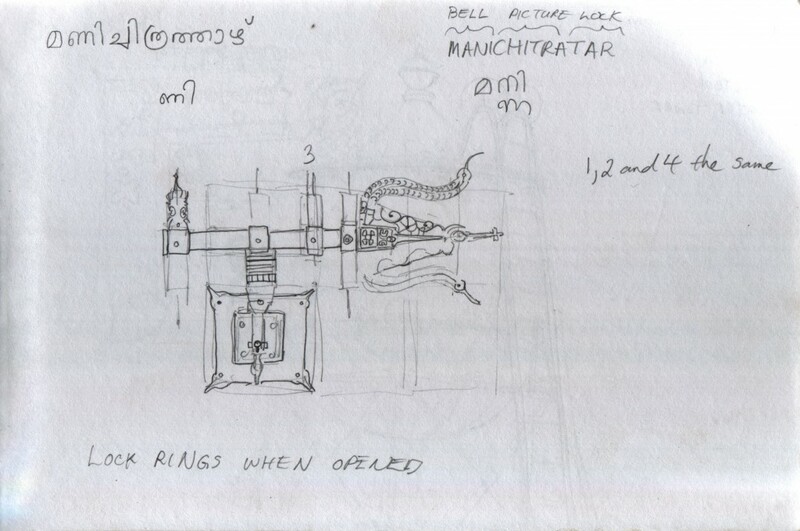 The “mannicchitrattaazhu”, or bell picture lock, is a traditional door lock in Kerala. This example of the lock, in the Ettukettu at the Hill Palace Museum in Thripunithura, is made of steel. When someone turns the key in the lock, the mechanism strikes a bell to notify the building’s inhabitants that someone is opening the lock. Hardware stores sell modern brass versions of the mannicchitrattaazhu for private homes. In Malayalam the lock is called മണിച്ചിത്രത്താഴ് (mannicchitrattaazhu). Lock detail on steel “mannicchitrattaazhu” in Ettukettu, Hill Palace Museum, Thripunithura. 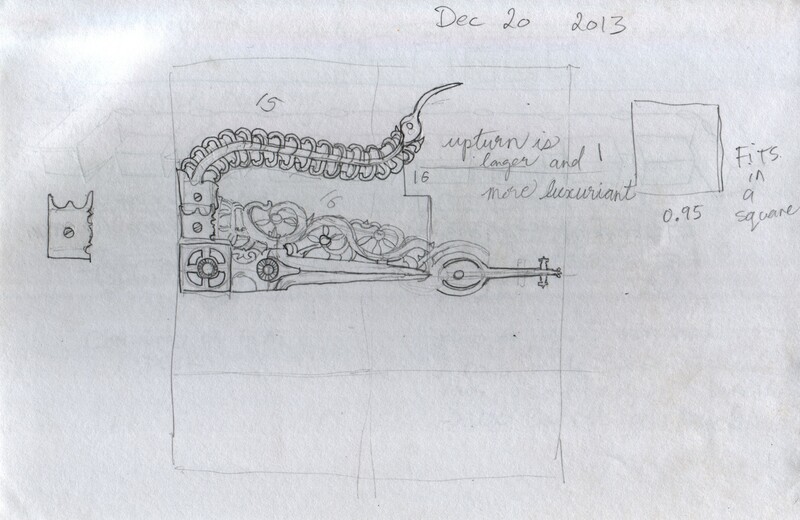 Still studying the steel “mannicchitrattaazhu” lock at the Ettukettu, Hill Palace Museum, Thripunithura. More details from “mannicchitrattaazhu” lock in Ettukettu, Hill Palace Museum, Thripunithura, Kerala. More details from steel “mannicchitrattaazhu” lock in Ettukettu, Hill Palace Museum, Thripunithura, Kerala. In Malayalam the lock is called മണിച്ചിത്രത്താഴ് (mannicchitrattaazhu), and means “bell picture lock”. Hand-forged iron or steel hinge on window shutter of Ettukettu. Riveted steel water tower with a finial on its roof at Hill Palace Museum, Thripunithura. Other museum visitors told me that the top is copied from temple architecture. The visitors told me that the name for the top is “makutam”, which perhaps translates as “sceptre” or ornamental top. The museum closes for a lunch hour, and the visitors must go outside. I sat amongst the trees in the palace grounds and sketched this three-wheel pickup truck during the lunch hour. 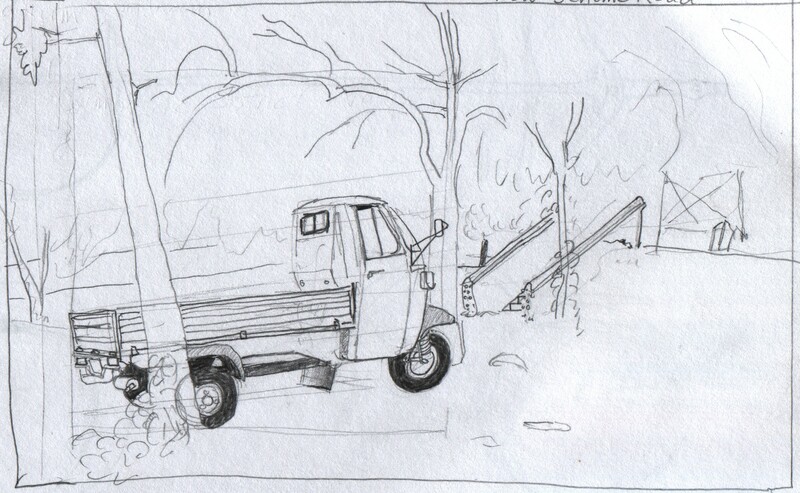 Such three-wheel trucks provide much of the transportation in Kerala, as part of a road population that also includes mid-sized trucks and semi-trailers.